Being busy and sweating out was never so pleasant. I am counting down the last few days before i leave for a very exciting biking expedition . A group of 100 women is biking through the most grueling passes in the Himalayas to reach the highest motorable road to Khardung La. I am a part of this wonderful group and will be cycling with them , starting from Kullu , going up to Khardung La and then back to Leh. It is a 600km ride to be covered in 17 days. I have been working out and eating well. Cooking quick meals for us and freezing the leftovers for my husband so that he can have healthy food all this while. 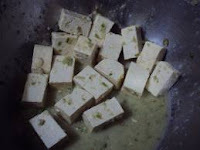 This tofu dish was such a quick success when i made it and it seems to be a quick enough recipe to share too. I wanted something very short n sweet to share before i leave and i found this sweet n sour tofu i made a couple of weeks ago. Perfect. Press the tofu between the sheets of kitchen towels to drain out excessive water from it. Cut pieces and mix with salt to taste, 1 tbsp of green chilly n garlic paste and 1 tsp of the corn flour. Once fried like this the tofu can be kept in the fridge till the time of assembly so this recipe is suited for large gatherings too . Just make the sauce at the last moment and enjoy a great dish made in a jiffy. To make the sauce , mix the soy sauce n tomato ketchup with the remaining garlic n green chilly paste , minced ginger , salt n pepper and 1/4 cup of water . Keep aside. In the same pan you shallow fried the tofu , tip in the diced onions. There is no need to add any additional oil as the pan is already greased to allow a quick roasting/shallow frying of the onions. 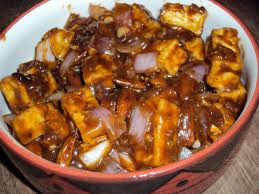 Just a few tosses and the onions will be slightly sweaty .That's the time when you pour the sauce in it and the shallow fried tofu too. Toss and mix well . Add the roasted almonds and serve immediately. Look at this , the onion still looks almost raw . The onion is actually half cooked and provides and nice texture along with roasted almonds. This is a nice way to make a recipe low on oil too. Tofu is fried and the other things are just tossed in like a salad . The dish can actually be served well like a salad too. Think about a spring roll if you fancy. A healthy dish which made my bones and joints stronger and my muscles more resilient for sure . That sounds so exciting. Enjoy yourself and have a safe trip. great show, lady. looking forward to meeting with ya, finally! aap ka sabari se intezaar hai... aur, aap ke promised nutrition bars ka, besabari se! see ya! 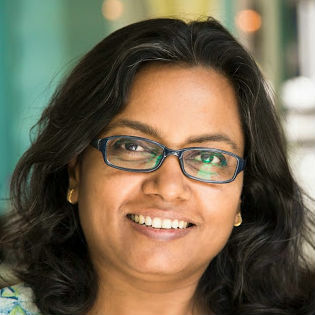 Hey Anita...thank you for gracing my blog . Intezaar hamen bhi hai ...besabri se!!! All the best for ur trip hope y hv wondeful timen this is something very innovative ..
Oh gosh, that sounds exciting! But it looks like it will be a long trip! Take care and be safe! I love tofu and this is a wonderful add to my treasure! Strangely enough it seems we have been in the same neighbourhood and you being a cook and still I missing you out !!!!! *BLASPHEMY* !!!! nice recipe..yummy pic..thanks for visiting my blog and your comment. You have a lovely space.. I made this last evening for dinner and it came out wonderful also because I am fond of chinese food so thats what I was thinking of while preparing this. I was apprehensive in adding almonds, but the roasted almonds reminded me of some long forgotten taste. I am planning to roast and keep almonds for snacking.